The barn's upper level indoor area is 72 X 50 ( 3600 sq.feet ) which includes a bar area that has a sink and a refrigerator. The outside deck is 70 X 19 ( 1330 sq. feet ) which overlooks the field and trees. There is an outside lower deck which is 20 X 25 (500 sq. feet). The lower level is divided into 3 rooms, with each room measuring approximately 600 sq. feet. Two rooms are for dressing which includes a bathroom in each room, mirrors, and furniture. The dressing rooms also have heating and air conditioning. 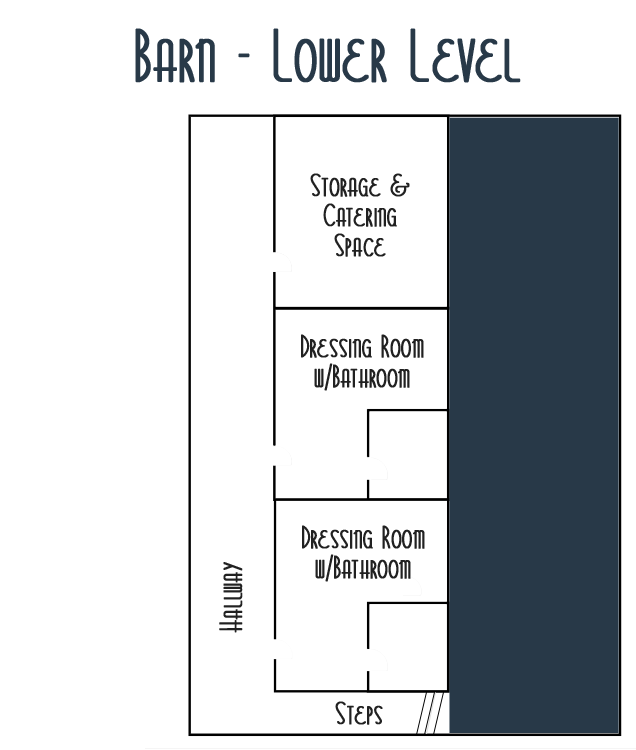 The third room is for storage and catering. This room has a commercial sink. There is an old saw mill barn and a grassy area on the property which many people have used for an outdoor wedding area. There are a number of great spots on the property for beautiful photos, including a vintage John Deere tractor which makes a great backdrop. Whether you're looking for boho chic or classic farm vibes, Bishop Farm is your rustic event destination! CREDITS: We are grateful to share photos on our site taken by Photography and Design by Jenny. Website design by Imagine Kitchen Creative Services.